MUSKEGON, Mich. — There’s not a suggestion of rookie green clinging to Hank Cherry now.A first-year Bassmaster Elite Series pro when the season began in March, Cherry of Maiden, N.C., has his first Elite Series win in the bag. In Sunday’s final-day, four-angler shootout in the Evan Williams Bourbon Championship, Cherry won the $50,000 first prize by a margin of 2 pounds, 10 ounces. Cherry weighed in 17 pounds, 8 ounces of smallmouth bass, easily getting the best of local favorite Kevin VanDam of Kalamazoo, Mich. VanDam posted 14-14 for the runner-up spot. Cliff Pace of Petal, Miss., finished third with 11-6. Edwin Evers of Talala, Okla., was fourth with 10-15.The Sept. 27-29 championship, part of Toyota All-Star Week out of Muskegon, began with 14 Bassmaster Elite Series pros. Each competed for two days on Muskegon Lake. Only the four pros with the highest Muskegon Lake weights made the cut to move to White Lake’s final leg. With Muskegon weights dropped, the four went head-to-head, starting from scratch. Cherry became the second rookie to win a Bassmaster Elite Series postseason event. Ott DeFoe won in 2011 to close out his rookie season. Cherry is not your typical rookie. He had years of experience competing in various circuits before he joined the Bass Pro Shops Opens series in 2011. At the end of his second year as an Opens pro, he won an event on Alabama’s Smith Lake and walked away with a 2013 Classic berth. He also qualified for the 2013 Elite season.In his first Classic appearance, he finished in third place. (He still looks back with pain on a lost fish that he says cost him the Classic win.) 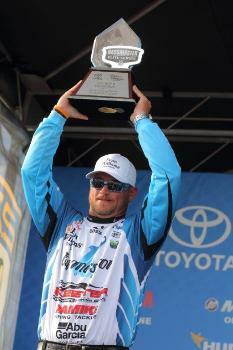 By the end of the regular eight-event Elite Series season, he had won the 2013 Bassmaster Rookie of the Year race. He finished 14th in points, easily securing a Classic berth for 2014.Sunday on White Lake, Cherry stuck to a pattern of throwing a swimbait off long points, the same pattern that produced for him on Muskegon for two days to get him to the final round. “I was around a lot of bait and a lot of fish,” said Cherry, adding that he caught about 25 bass throughout the day. Most of them took his Damiki swimbait rigged on a 1/4-ounce jighead with a 4/0 hook, all in various shad finishes. His key spot was special because of an underwater sandbar that created a “huge current break,” he said, which set up as a perfect spot for smallmouth bass chasing baitfish.“The shad were there in bunches around that breakline. That’s all it was,” he said.One flurry of catches on his magic spot that lasted about 45 minutes sealed the deal for him.“I caught a 4 (pounder), a 4, a 3, a 2/12, a 2/12. I don’t know what happened to turn them on,” he said.An early-day decision to give up on his quest for largemouth, for which White Lake has a reputation, paid off.“I just stopped and said, ‘I’m going smallmouth fishing,’” he said. The event’s Carhartt Big Bass award of $1,000, plus another $500 for wearing Carhartt apparel, went to Pace. He took the award for his 4-14 smallmouth of Friday from Muskegon Lake.Cherry received the $1,000 Power-Pole bonus. Running concurrently with the Elite Series event was the Carhartt Bassmaster College Series Classic Bracket on Grand River. The coveted prize of that event, an entry in the 2014 Bassmaster Classic, was won by Jordan Lee of Auburn University in Auburn, Ala.
On Sunday, eliminated Elite pros paired up with veterans and other guests in the Folds of Honor Foundation Pro-Am presented by ARE. The Folds of Honor Foundation provides educational scholarships to the dependents of service members killed or disabled while serving our country. Contribution buckets were passed through the crowd at the weigh-in to support the cause. Bassmaster fan Clay Wilson of Rogers, Ark., won the Toyota All-Star Fan Favorite Angler Sweepstakes prize of a 2014 Toyota Tundra valued at $35,000. His name had been randomly paired with Cherry’s before the competition began.